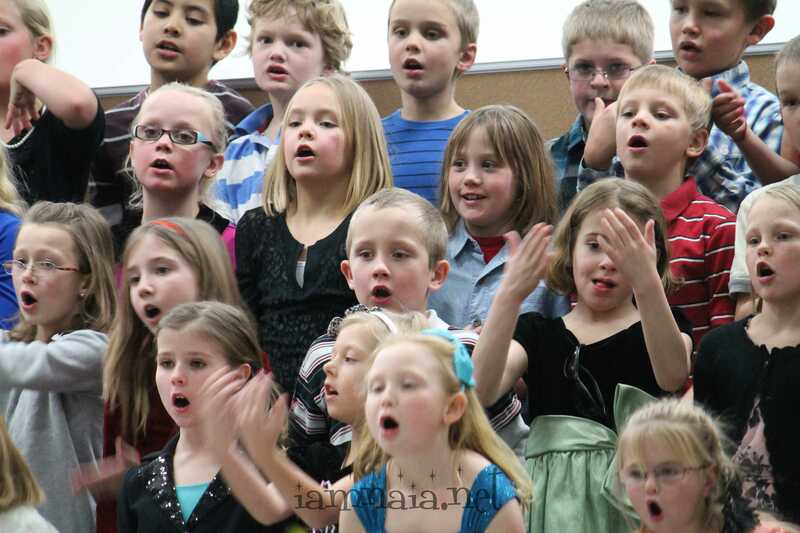 The next set of pictures to show off is Caiden’s school performance for Christmas. They did a theme of “The Littlest Christmas Tree” and it was very darling. 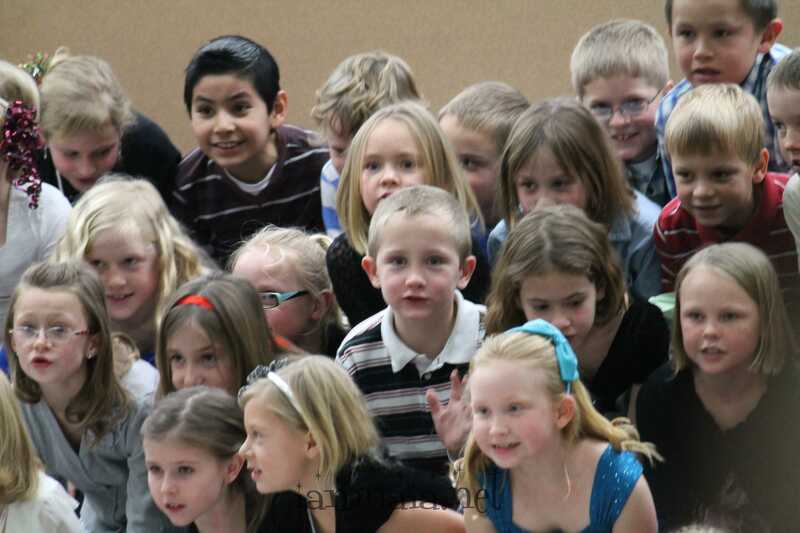 There’s my gorgeous second-grader, walking in with his class and looking for his mommy and daddy. I was very glad that Mark got to be home for his two weeks while the school productions were going on. 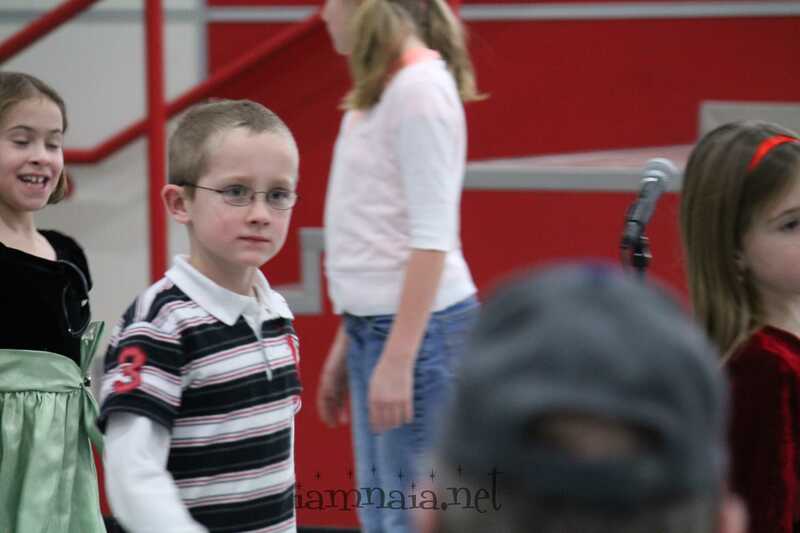 He got to see Caiden sing! I was very excited and very teary-eyed while watching Caiden actually SING during this production. 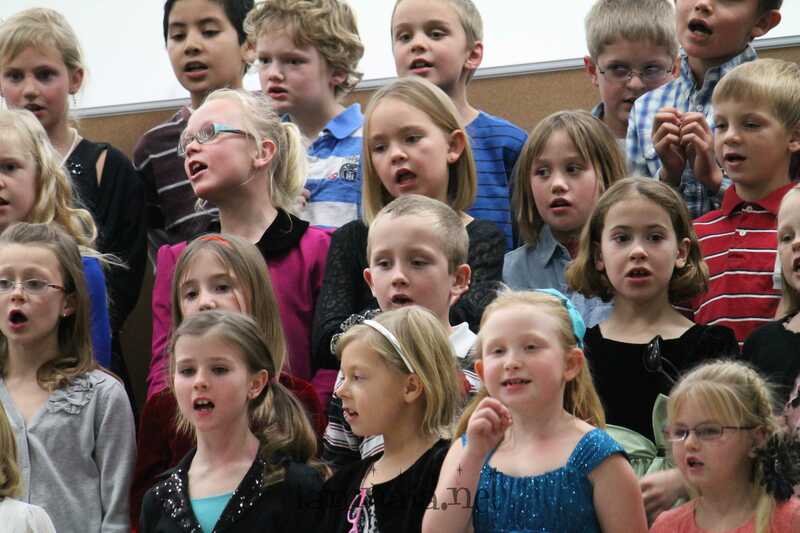 He’ll never understand how proud I was just because he belted out words to songs with his class. After several years of him *not* doing so, it was a joy to see it this time! And – he even did the hand motions! That’s about all the pictures I have. 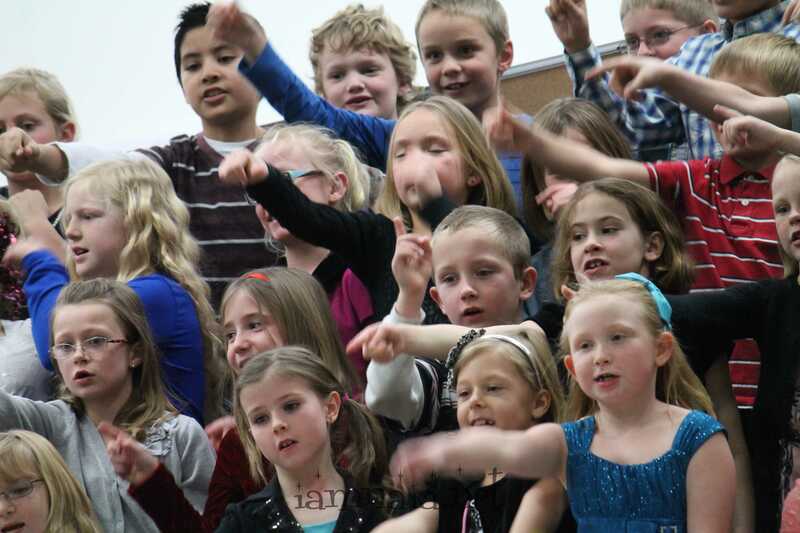 Well, I really have a bunch more but they are all of the same picture – Caiden singing along with his classmates. There’s only so many of those you want to see, right? He is so cute and I was so proud of him. I can’t say it enough! 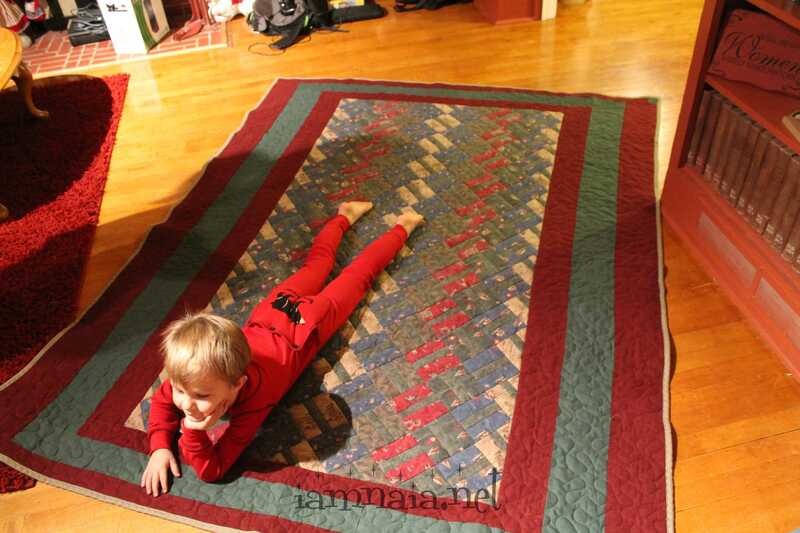 I finally found a picture of the back to one of the quilts I made with my mom while I was in Oklahoma. We didn’t have enough fabric for a complete back, so she came up with this idea for the back. I love it – especially since her and I did it together, y’know? Before Dad left for work, he played with the boys. 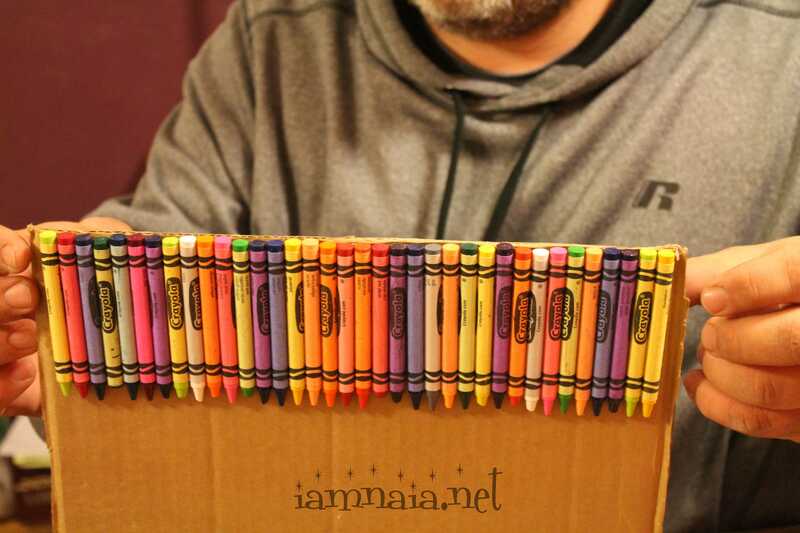 One of the things he did was glue some crayons to cardboard and melt them with a hair dryer. The boys were having a great time watching the wax melt. 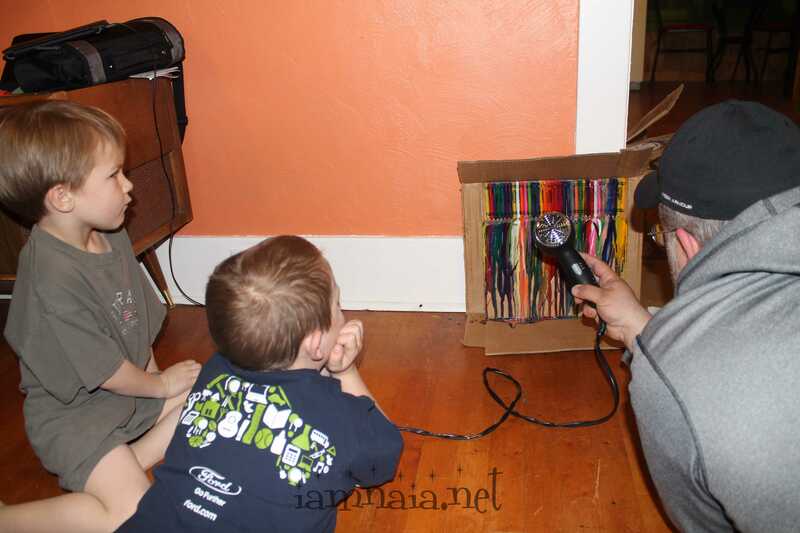 We’ll have to find a hot glue gun and do this again – maybe with a rainbow instead of a big mix of colors. You can see Brendan’s watching me with the camera out of the corner of his eye. Before I picked up the camera, they were both watching the crayons pretty intently. 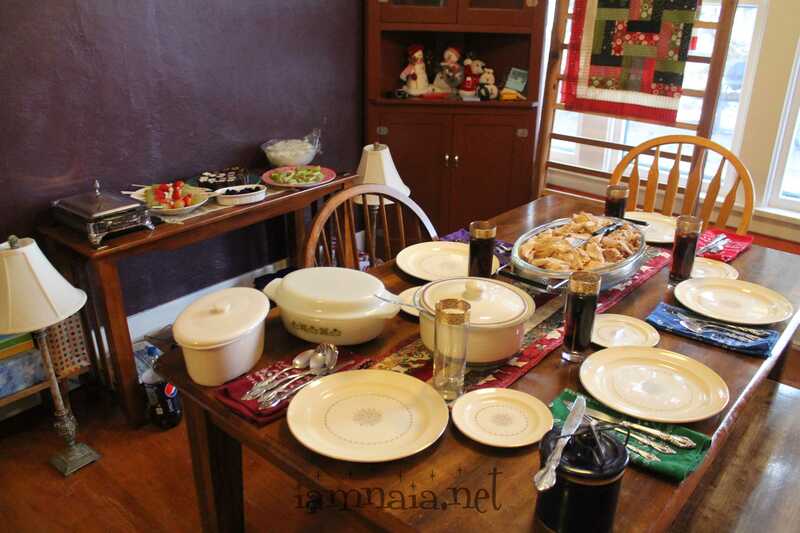 On December 23rd, we had a Thanksgiving and Christmas dinner in one. Mark wasn’t in town for Thanksgiving and he was leaving on December 24th (after we opened presents). This was our way of making sure we had Christmas with daddy. It was a lot of fun with all three adults pitching in, getting things ready and laughing and having a good time in the process. 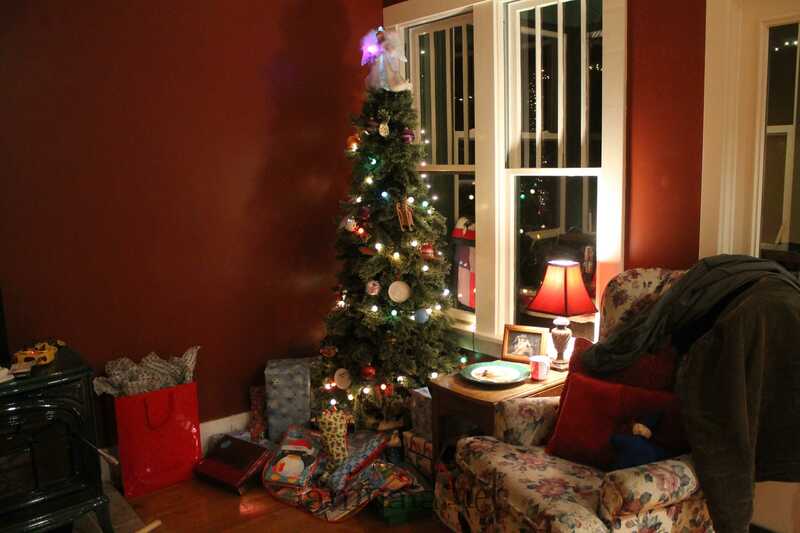 Our Christmas Eve was December 23rd (we did Christmas on the 24th – just before Mark was supposed to leave for work). 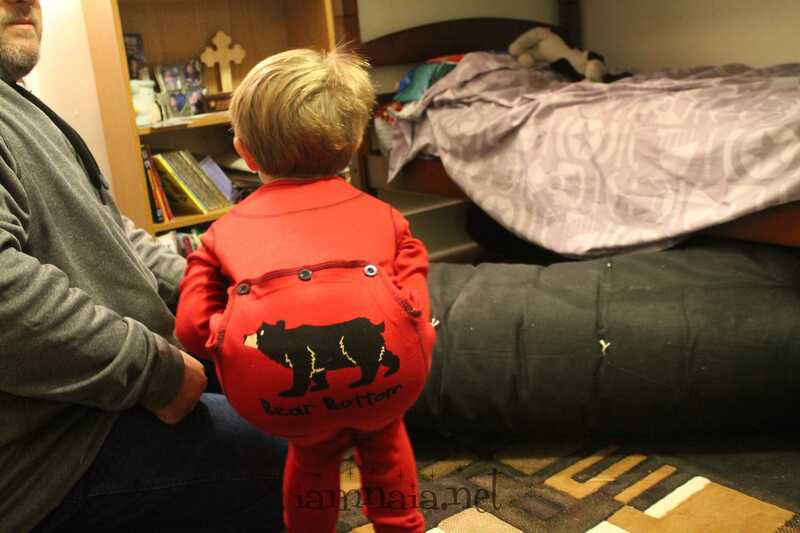 The boys got some “Bear Bottoms” pajamas, a quilt from mom and all the presents under the tree that were bought by us for us – not Santa gifts. Brendan in his new jammies and quilt from mommy. It was actually a community effort getting the quilt together in time this year (since I didn’t get it done last year and moved this year when trying to finish it). 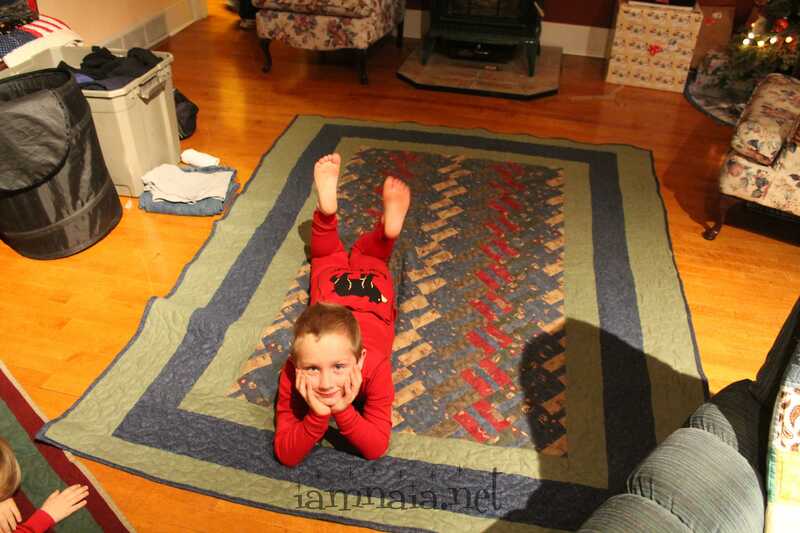 Caiden in his jammies with his quilt. The stuff in the background is Mark prepping to leave the next morning. We tried to keep things upbeat so the boys wouldn’t get sad about his leaving. OOOH! Look! 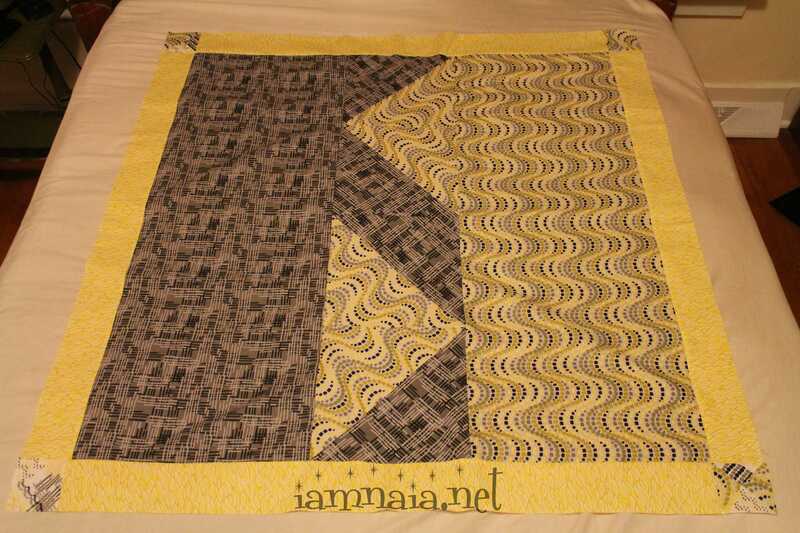 I got another quilt kit for Christmas! Why is Jen grinning from ear to ear? Well, when I was making that scarf for her, I kept telling her how much my mom would love it and I couldn’t wait to mail it out to her. 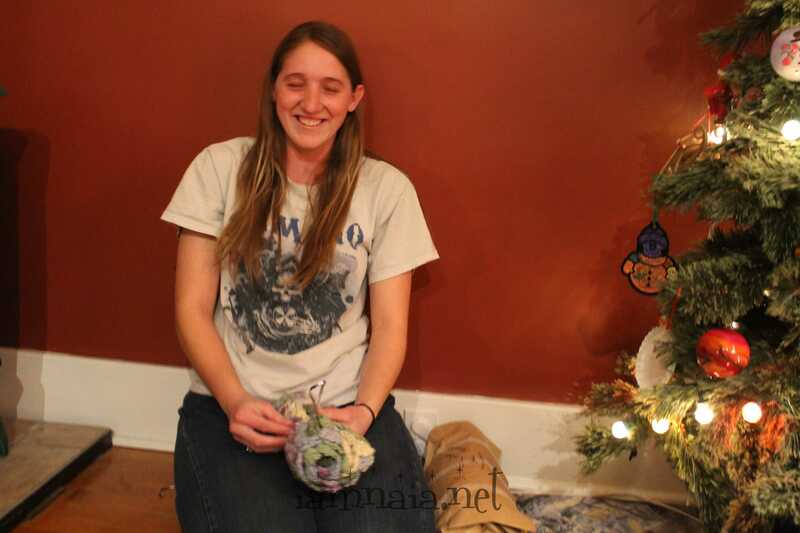 I had to hide the fact that I know Jen likes purple and I was making a purple scarf somehow! So I lied. It’s Christmas! It’s allowed during Christmas! 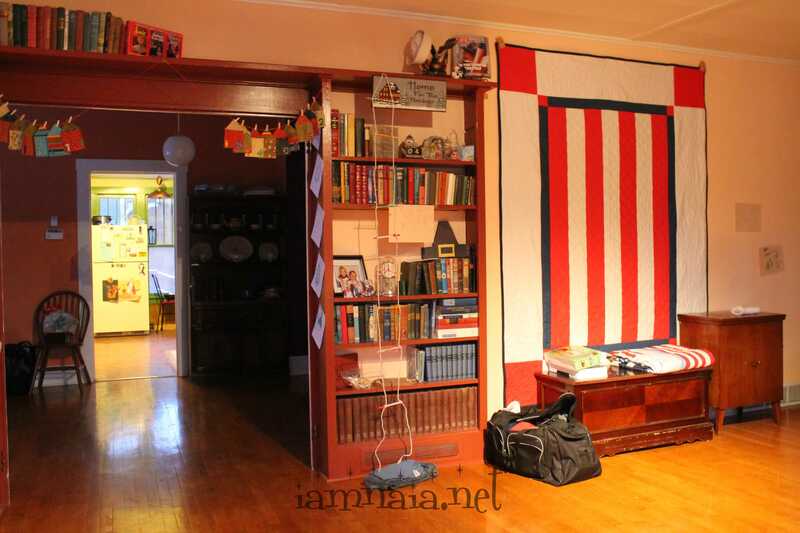 P.S., the colors match the quilt I made for her in 2012, by the way. That was the best part of the surprise. P.S.S., see the bag beside Jen? She was teased for two days about what was in the bag. 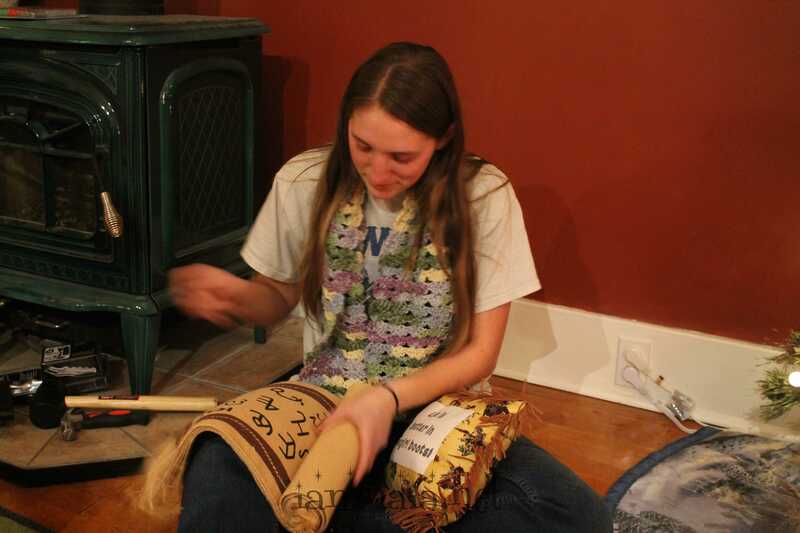 When it came time for the scarves to be delivered to everyone, I told her she had a choice, “You can open the bag or give everyone what is left under the tree. Not both.” After teasing her for two days, she thought it was highly unfair to ask her to give up what was in the bag to deliver the remaining gifts under the tree. Only up until she saw that she had a scarf under the tree, as well. 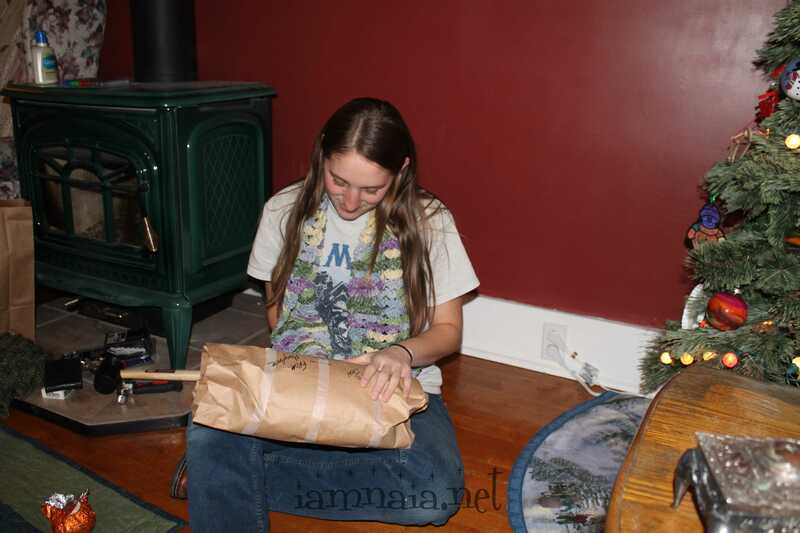 P.S.S., in the process of ripping open the bag, Jen didn’t notice an envelope under the tree as well. It was a gift certificate for two pre-paid books on order for her at the local bookstore. 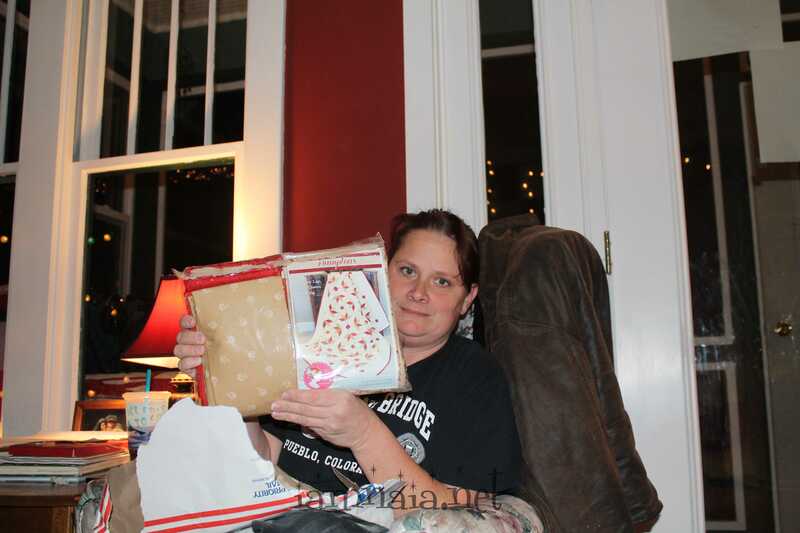 She got those two days after Christmas, when I finally remembered there was still an envelope under there. 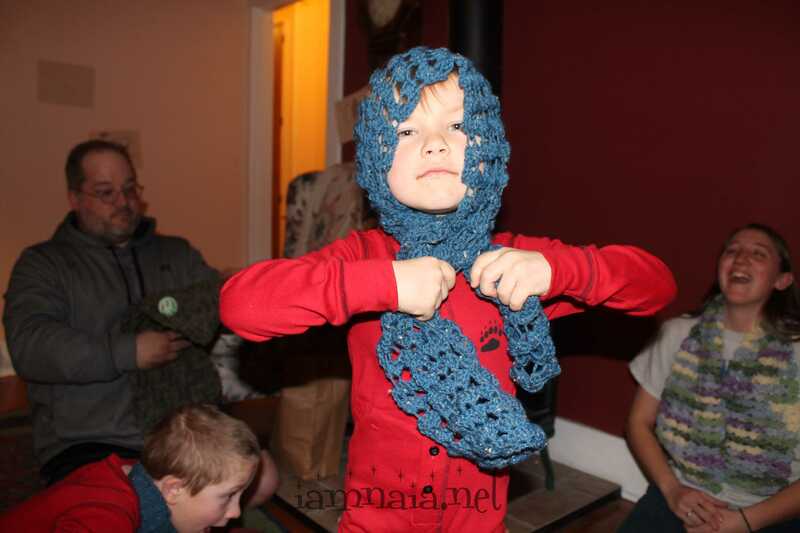 Brendan’s scarf became a bonnet – and still is, whenever he wears it. 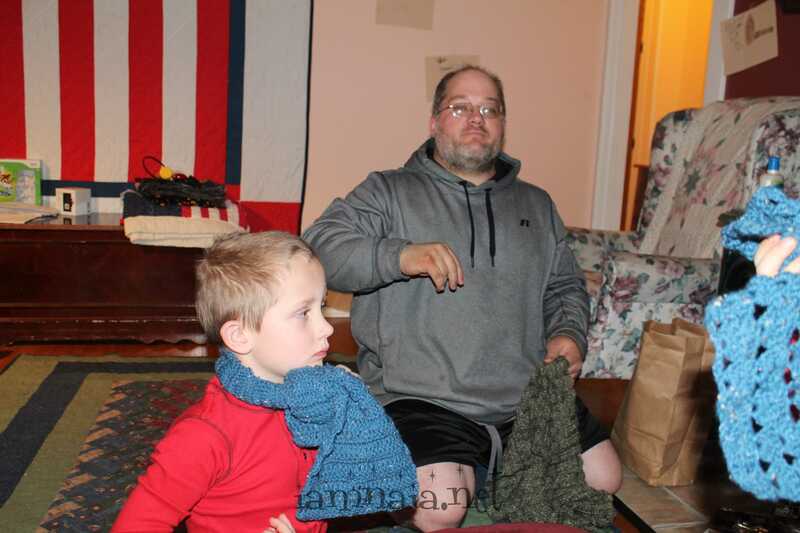 Caiden and Mark with their scarves. 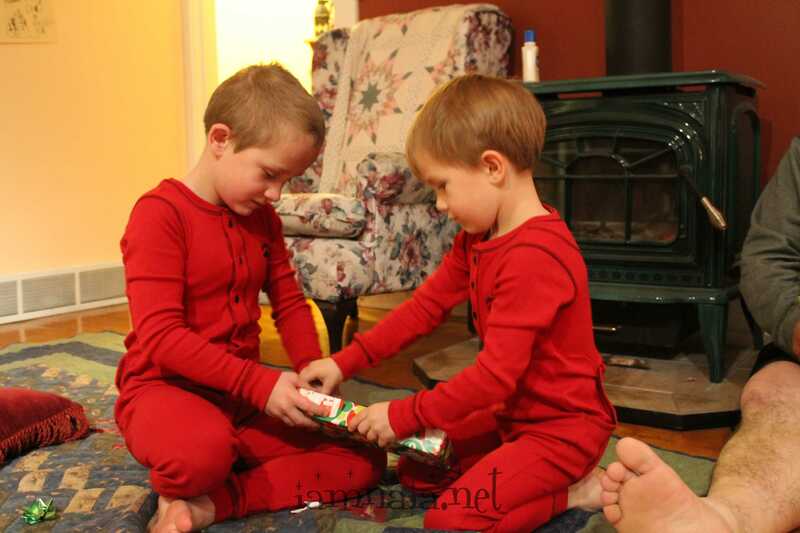 My boys opening a gift from their Grandma Donna together. Finally, the bag she’s been teased about. Only problem is, Mark had a great time wrapping it in a lot of tape to make it difficult to open. A couch pillow that says, “Life is better in cowgirl boots” and some country place mats for her non-existent dining room table. She got her first set of cowgirl boots this winter so the pillow goes great with her theme for the winter. The boys and dad got a joint gift – two helicopters to play with dad with. Unfortunately, they never once worked and Mark declined to return them for different ones. They are hidden in my closest so the boys can, hopefully, forget about the joint present they got and never got to use. 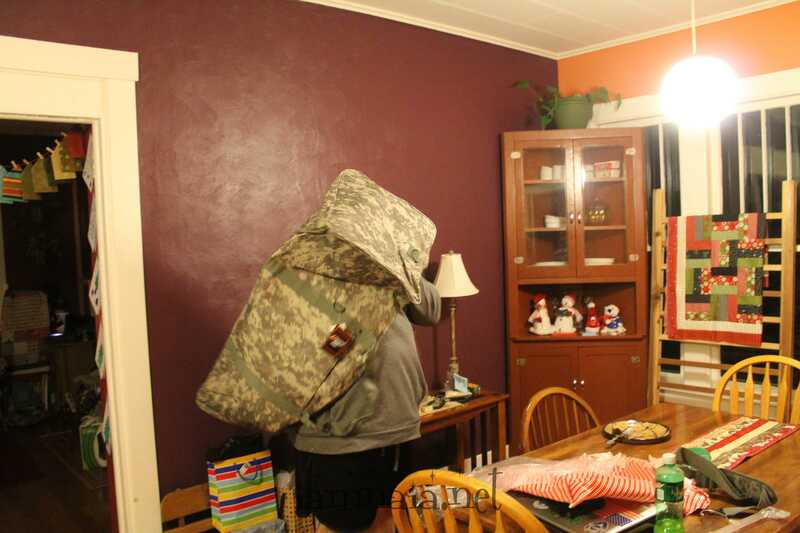 Mark also got a huge military duffle bag. 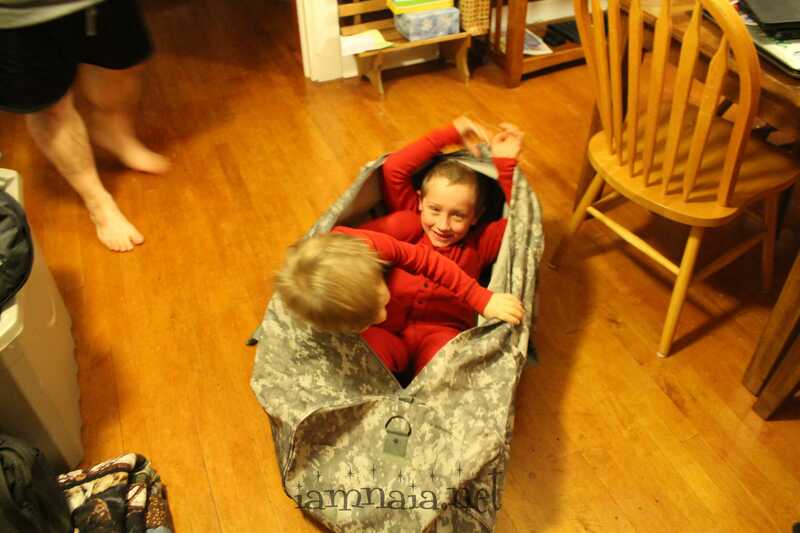 It is strong enough and big enough to fit both my children at the same time but not quite big enough for Mark. 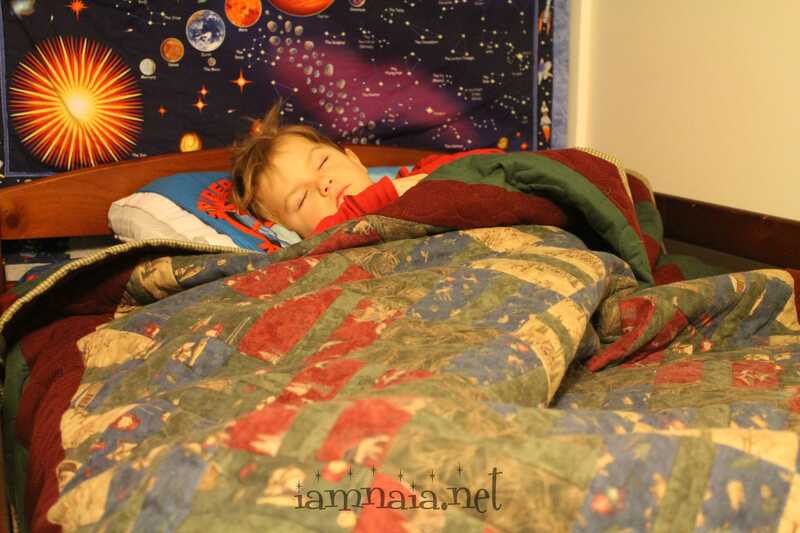 with dreams of Christmas morning filling their head. Both of my boys attend Royal Rangers at the church. My brothers went through it and I always said I would put my own boys through the program. It is very similar to Boy Scouts except there is a strong religious tone to everything they learn. The following is a night out with Dad. 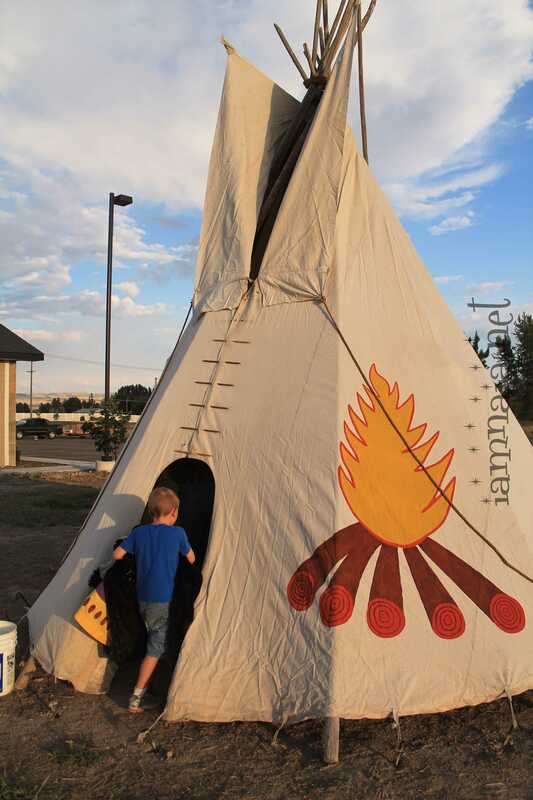 Caiden spent the night with the Royal Rangers and Dad, sleeping in a TeePee. I’ve asked Dad to post the pictures and tell a bit about what went on. I wasn’t there – no girls allowed! I love my boys… We have two. Two of them is enough. They can play together, entertain each other, and fight against/with each other. I like the number two. I have incredible respect for people who volunteer to teach or spend time with “groups” of kids. I couldn’t do it. The overnight TeePee camp out and morning breakfast was this last weekend. The Ranger commanders were nice enough to try and schedule it when I was home and could go with my son. When Mom told me about it and asked if I was going I thought to myself, “Sure, it will be an easy night and fun.” I was wrong and I was right both. We got there and the first thing they do is pull out the bows, hatchets and knives! 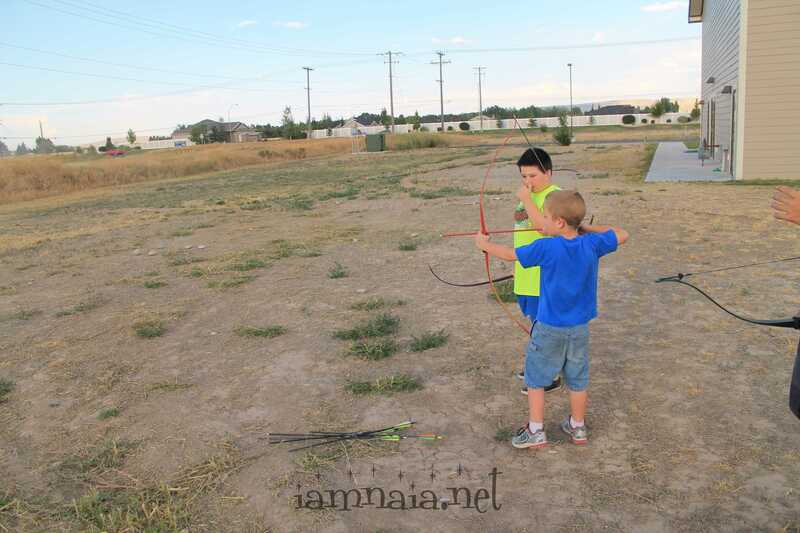 My son has a little experience with bows, but they are the safe kind. They are made from PVC pipe and the arrows have foam tips on them. You can’t hit the side of a barn with them, but you don’t have to worry about getting shot through the eye either. These were real bows! Real arrows! Granted, they were field points and the bows were not very powerful which made it a little easier. However, I immediately went into Dad-Watch mode. He did pretty good for how little practice he has had with the real thing. 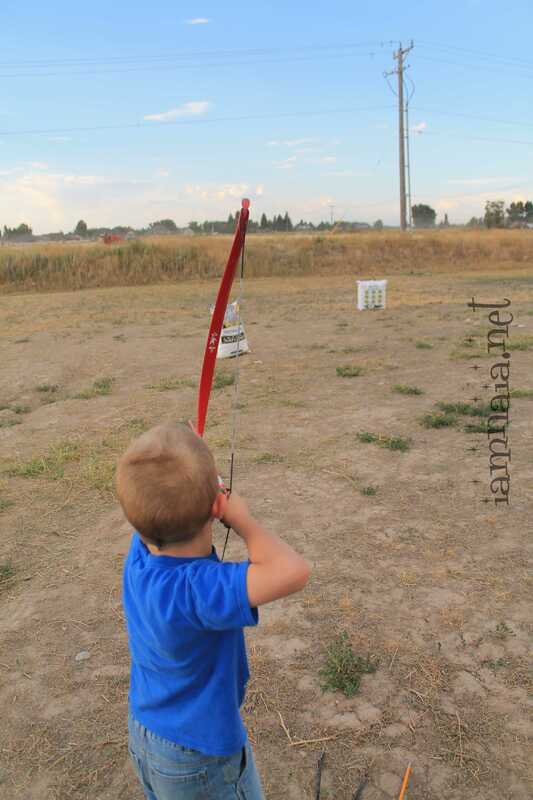 Always within a foot of the target, I was pretty proud at his shooting skills for he is only 6. 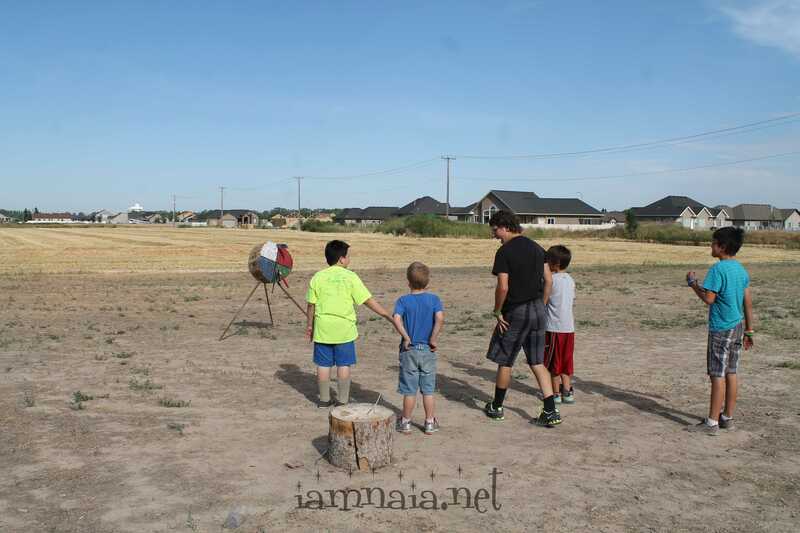 They shot bows until my son got tired of it and walked over to try throwing tomahawks and knives. He was the youngest boy there that stayed the night but I kept close and tried to help him stick one in the log. 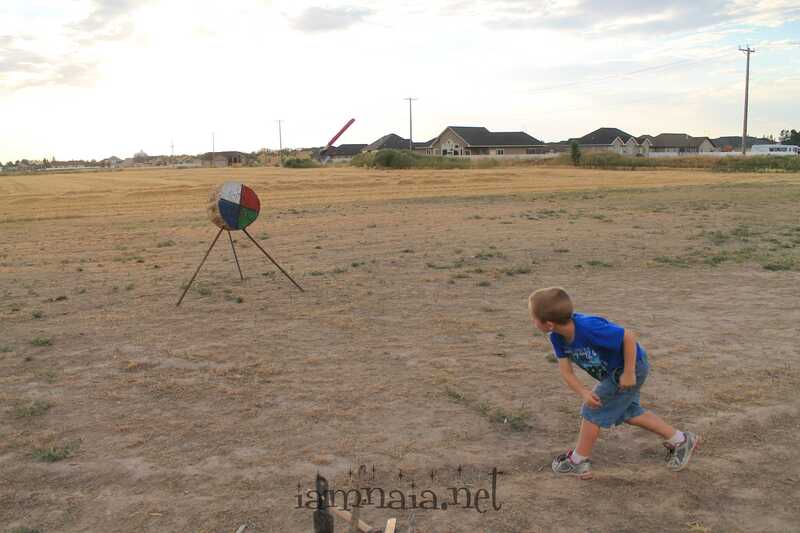 He did hit it a few times, but it never did stick. Dad even tried it a few times.. I could stick the tomahawks, but the knives I need to practice…. This is where we slept. He couldn’t wait to set up his sleeping spot. 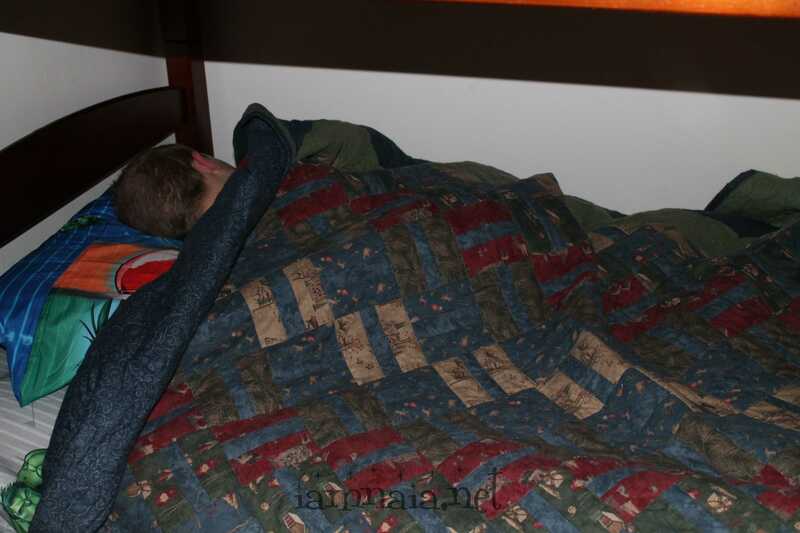 His first time sleeping in a tepee and we even had a fire burning in there for a little while before bed. I think the part the people that officiate these little gatherings enjoy is getting our children dirty and sticky, then sending them home to us to clean them all up. They fed them hot dogs and S’Morkies. What is a S’Morkie? Good question, and one I asked immediately after I heard the word. You roast a marshmallow then squish it between to chocolate chip cookies. 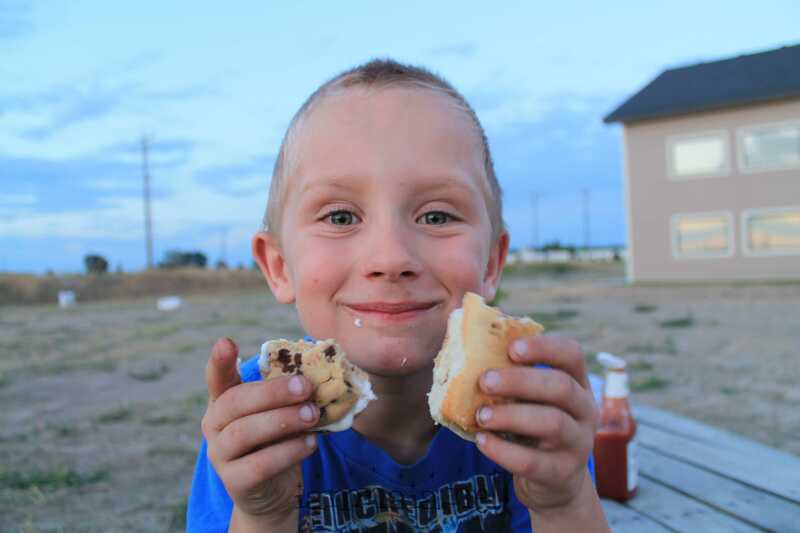 We had eaten before we showed up but the boy still ate a few hot dogs and at least a couple of these “S’Morkies” even though I tried to intercept him when he went to make another of those sticky gooey things. He must be going through a growth spurt or something. I have to admit that those S’Morkie things are yummy if you want the sugar sickness…. So I spent the evening running around, trying to make sure that my son kept all his fingers and toes.. Oh and eyes! It was pretty exhausting for me. 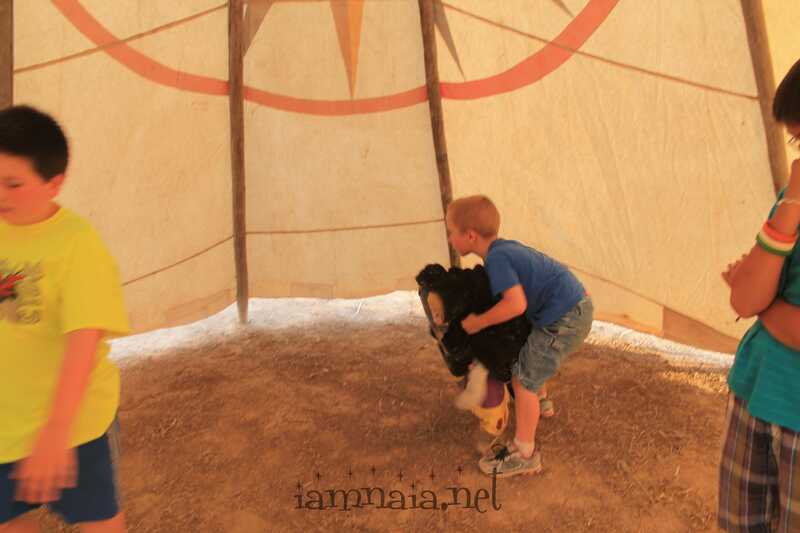 I was so happy when it was decided to climb into the tepee and try to sleep on the hard unforgiving ground. Little did I know that this was the code for lets talk and giggle until 3am! I have to give my boy credit though, once I did calm him down he was the first one asleep! I fell asleep about the same time. Morning arrived and guess what? 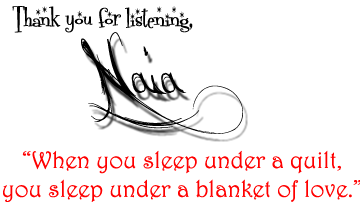 Yup, I was the last one to crawl out of the sleeping bag. I do mean crawl… It has been awhile since I have last slept on the dirt and my body was cussing me out the only way it could.. pain.. 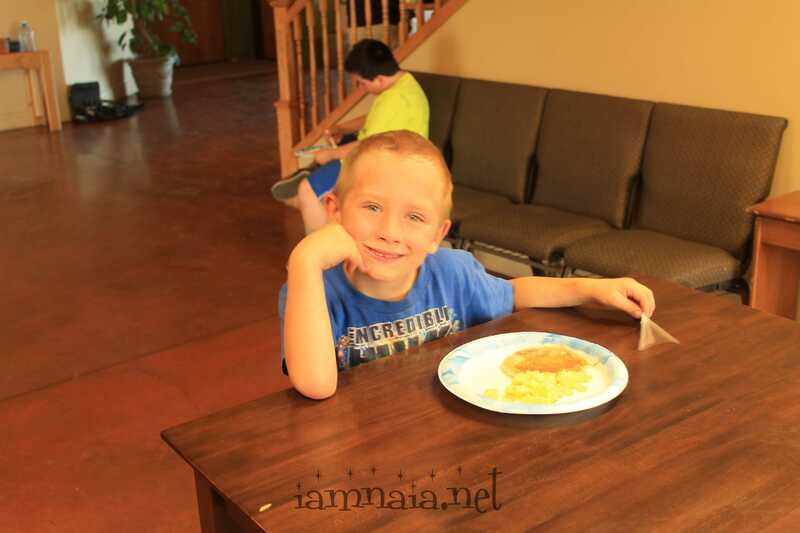 There was a father/son breakfast planned for that morning and we all went into the church. I cooked up the eggs while the kids played ball. Scrambled eggs and huckleberry pancakes. After breakfast there was more throwing of sharp pointy things until it was time to leave. There ya have it. A night out with Dad and the Royal Rangers!